Since January, 1st, 2015 journal “Vrach i informacionnye tehnologii (Physicians and IT)” introduced new author and submission guidelines. 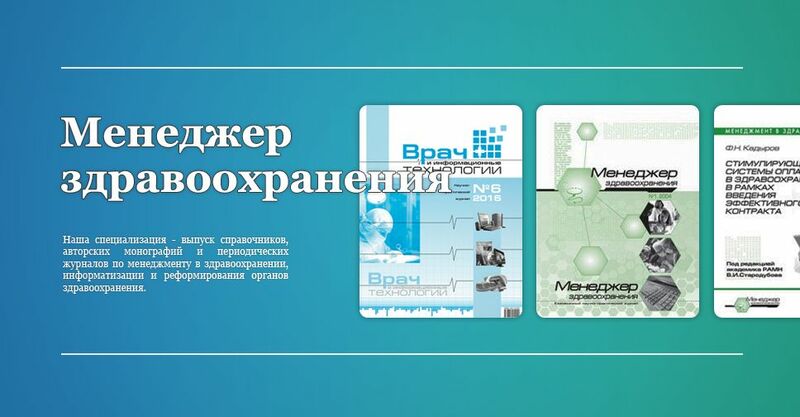 Author and submission guidelines for the journal “Vrach i informacionnye tehnologii (Physicians and IT)” were developed with due regard to requirements of Higher Attestation Commission of the Ministry of Education and Science of the Russian Federation and the ICMJE recommendations. 1. The manuscript should be initialed by the supervisor and accompanied by an official Letter of Confirmation issued by the affiliate institution of the manuscript that dwells with issues covered by the publication. In some cases the editors may need an expert opinion or opinion of the Ethics Committee to conduct the published study. The Letter of Confirmation printed on the institution’s headed note-paper should indicate whether the article pertains to the thesis work. 3. Authenticated signatures of the authors (last page of the manuscript) together with the Letter of Confirmation, initialed by the institution’s management should be scanned. Scanned documents are then sent to the journal via e-mail. 4. Manuscripts already submitted to other publishers should not be sent to the Journal editors. If any part of the manuscript has been published by other publishers, the Letter of Confirmation should note that with the intent that the Journal’s editors make an informed decision about publishing the presented text. 1 The manuscript should be sent to the editors in electronic format (either on disc or via e-mail). The manuscript should not exceed 10-24 pages. 2 The journal accepts manuscript files in MS Word 97/2000/XP/2007/2010.doc,.docx, size 14, Times New Roman, 1.5 line space. 4 All keywords and key phases (five to seven words ideally) are separated by semicolon. 5 Universal Decimal Classification (UDC) mark (not obligatory) is given together with the UDC acronym in the upper left corner of the first page. The UDC classification mark is determined though the complete edition of the Universal Decimal Classification. 6 The manuscript should contain Abstract, which is the main source of information in national and international information systems and databases that index the Journal. 7 The intent and content of the Abstract in Russian and English should be consistent. 8 Structure of a scientific article outlined by the Recommendations for the Conduct, Reporting, Editing, and Publication of Scholarly work in Medical Journals of the International Committee of the Medical Journal Editors should include the following sections: “Introduction”, “Methods”, “Results, “Discussion” and “Conclusion”. This structure is not an arbitrary publication format but a reflection of the process of scientific discovery. Methods. This section should clearly describe the selection of observational or experimental participants (including controls), including eligibility and exclusion criteria and a description of the source population. The guiding principle of the Methods section should be clarity about how and why a study was done in a particular way. The section should aim to be sufficiently detailed so that other researchers would be able to reproduce the results. Numeric results should be given not only as derivatives (for example, percentages) but also as the absolute numbers from which the derivatives were calculated. The Results section should also specify statistical methods used to analyze data. Tables and figures should be restricted to those needed to explain the argument of the paper and to assess supporting data. Graphs should be used as an alternative to tables with many entries; data should not be duplicated in graphs and tables. Nontechnical uses of technical terms in statistics should be avoided, such as “random” (which implies a randomizing device), “normal,” “significant,” “correlations,” and “sample”. Discussion. Emphasis should be placed on the new and important aspects of the study and the conclusions that follow from them in the context of the current best available evidence. Data or other information given in the Introduction or the Results section should not be repeated in detail. It is useful to begin the discussion by briefly summarizing the main findings, then explore possible mechanisms or explanations for these findings, compare and contrast the results with other relevant studies, state the limitations of the study. It is also advisable to explore the implications of the findings for future research or for clinical practice. It is important to link the conclusions with the goals of the study but avoid unqualified statements and conclusions not adequately supported by the data. In particular, statements on economic benefits should be avoided unless the manuscript includes the appropriate economic data and analyses. Claiming priority to the study should be avoided. It is appropriate to state new hypotheses when warranted, but label them clearly. 9 Text and other materials should be thoroughly checked. 10 The manuscript should not use foot references to citation courses. Only end references are allowed. 11 References to sources should be enclosed in square brackets. If there are several sources, they are listed in ascending order, separated by commas without spaces. For example: [2,4,6,8]. If several references are cited in the same place in the text, a hyphen for joining the first and the last numbers inclusively should be used [2-6,8-12]. Do not use a hyphen if there are no intermediate numbers in citation, for example, [1-2]. The text should not contain references to sources not included in the References. 12 The manuscript should be accompanied by References (Bibliographic List) containing at least nine references. 13 References should follow the standards summarized in the Recommendations for the Conduct, Reporting, Editing and Publication of Scholarly Work in Medical Journals developed by the: International Committee of Medical Journal Editors (Vancouver style). Lack of references in the manuscript is sufficient for rejecting its publication. As a rule such manuscripts are returned back to the author (authors) for proper organization. 14 References should be thoroughly checked and numbered; in the manuscript text references should be given in square brackets in strict compliance with the References organized in alphabetic order. 15 References should first list publications of the Russian authors, including works by foreign authors, translated into Russian, followed by references, published in foreign languages, including works by local authors, translated into a foreign language. References should not include unpublished works and textbooks. Personal work is not recommended for inclusion in the References. 16 A reference should list the first six authors. If there are more authors, the sixth author is followed by et al at the References. 17 Reference to a citation should immediately follow the citation either in square or round brackets. If the square brackets are used, the first comes the citation number in the References, and then, after a comma, the page number with the letter "c". For example, [10, p. 81], or if the cited text reaches the next page [10, p. 81-82]. If the citation is enclosed in round brackets, it should be organized as follows: initials and surname of the author/authors, followed by the year of publication, and then - the citation number in the References in square brackets, followed by a comma, page/s. For example: (I.I. Petrov, 2012 [33, p. 29]). 18 The manuscript text should not contain any citations not included in the References. 19 Correct description of the sources listed in References is a guarantee that the cited publication will be counted when assessing scientific work of its authors and the affiliate organizations. Original papers are allowed to cite no more than 30 sources, literature reviews – up to 60. Besides fundamental works, References should contain publications for the last 5 years. 20 Verification of references is the sole responsibility of the author. 21 The number of illustrations (figures, tables, charts, diagrams) is limited to 10. 22 All formulas should be thoroughly checked. 23 Tables should only contain essential summarized and statistically processed data. All data must be interpreted in the text of the article. Uninterpreted data should not be included in tables. All tables should be numbered and titled. All clarifications should be provided in notes (footnotes) rather than in titles. 24 Figures. Letters, numbers, and symbols on figures should be clear and answer their purpose. Titles and detailed explanations should be given in the legends - not on the illustrations. Interpretation of all illustrations in the article is mandatory. 25 Full name and business contacts including e-mail of the author who is the focal point for the editors should be provided at the end of the manuscript. 26 Information for the Russian Science Citation Index should be provided on a separate page. This information includes full names of all authors (in Russian and author’s transliteration), official title of the affiliate institutions (in Russian and English), accurate postal address (in Russian and English), institution’s postal code, job titles, science titles and degrees, and e-mail address. 27 Publication is free of charge. 28 Editors will not consider manuscripts that fail to meet the formatting and submission requirements of the Journal.